Crafting With Nana: Cardz TV Challenge #2 - Make a card using fall icons: leaves, acorns, corn, scarecrow, etc. Cardz TV Challenge #2 - Make a card using fall icons: leaves, acorns, corn, scarecrow, etc. Hello everyone! It's time for Cardz TV Challenge #2. 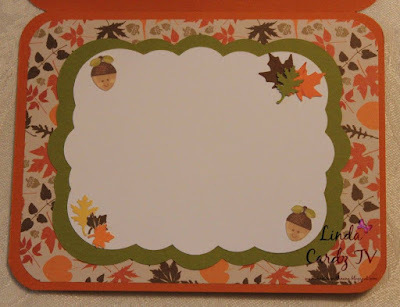 This challenge is to make a card using fall icons: leaves, acorns, corn, scarecrow, etc. 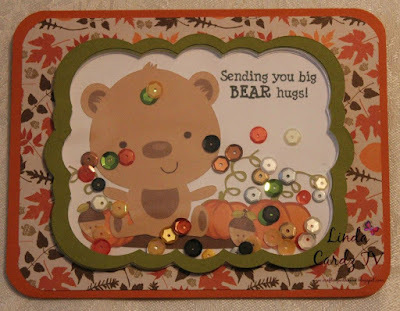 For my project I created a shaker card using the sentiment "Sending you big BEAR hugs!" from "Beary Sweet" stamp set. I used the Cricut Explore print then cut feature to cut out the bear in pumpkin patch and added some cute acorns. The frame is cut from the Cricut Elegant Edges cartridge. 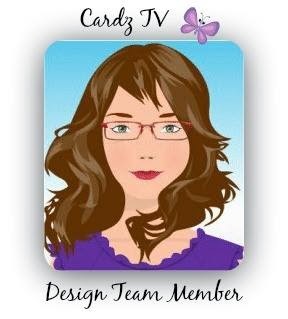 Please be sure to stop by Cardz TV and see all the wonderful design team projects and to enter your card using fall icons for a chance to win one of Mary's Cardz TV stamp sets. You have until noon EST, Thursday, October 8, 2015 to enter. The winner will be chosen by random.org. I look forward to seeing all of your creations! I would love for you to leave me a comment and become a follower! The bear you used for this card is so cute. I love fall icons you added and papers you chose. Beautiful card! !